Continuing with XML, in this simple example I'll show you how to write to a xml file and then load and transform strings to float. This is the prototype of the xml file, written by hand. Save the XML file into your project, if you want you can delete rotation node because the program will create everything automatically. Below, the main program code with the functions WriteToXml () and LoadFromXML (). public class ReadXmlData : MonoBehaviour // the Class. 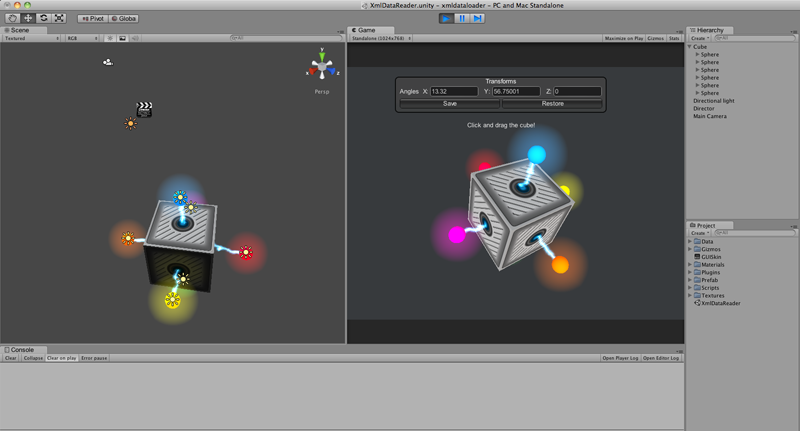 public GameObject CubeObject; // object to get a apply the transforms. private string x = ""; // string to work with the xml file. private string y = ""; // string to work with the xml file. private string z = ""; // string to work with the xml file. private float X = 0; // we will apply the values ​​of the strings here. private float Y = 0; // we will apply the values ​​of the strings here. private float Z = 0; // we will apply the values ​​of the strings here. x = CubeObject.transform.rotation.eulerAngles.x.ToString(); // taking the values ​​of transformation. y = CubeObject.transform.rotation.eulerAngles.y.ToString(); // taking the values ​​of transformation. z = CubeObject.transform.rotation.eulerAngles.z.ToString(); // taking the values ​​of transformation. WriteToXml(); // calls the function when the button is pressed. LoadFromXml(); // calls the function when the button is pressed. elmRoot.RemoveAll(); // remove all inside the transforms node. XmlElement elmNew = xmlDoc.CreateElement("rotation"); // create the rotation node. XmlElement rotation_X = xmlDoc.CreateElement("x"); // create the x node. rotation_X.InnerText = x; // apply to the node text the values of the variable. XmlElement rotation_Y = xmlDoc.CreateElement("y"); // create the y node. rotation_Y.InnerText = y; // apply to the node text the values of the variable. XmlElement rotation_Z = xmlDoc.CreateElement("z"); // create the z node. rotation_Z.InnerText = z; // apply to the node text the values of the variable. elmNew.AppendChild(rotation_X); // make the rotation node the parent. elmNew.AppendChild(rotation_Y); // make the rotation node the parent. elmNew.AppendChild(rotation_Z); // make the rotation node the parent. elmRoot.AppendChild(elmNew); // make the transform node the parent. X = float.Parse(transformItens.InnerText); // convert the strings to float and apply to the X variable. Y = float.Parse(transformItens.InnerText); // convert the strings to float and apply to the Y variable. Z = float.Parse(transformItens.InnerText); // convert the strings to float and apply to the Z variable. CubeObject.transform.eulerAngles =new Vector3(X,Y,Z); // Apply the values to the cube object. Here the full project source, give your comments and enjoy it! So you could use this to write save games to remember the exact position and status of everything in the engine from objects to variables? Amazing! The only con. is that its not crypted so its editable by anyone, but exactly that characteristic will fit into my project!!! Thank you VERY VERY Much for the help!!! does it works with free unity version? Yes, in fact, was done in the free version. thanks for the comments. You can download the full project in the end of the post, and then study how it was done. Hi I try this code and it works for my almost perfect. I've got some problem with export it to web player. It stops in line 79 "if(File.Exists (filepath))". If I skip this code stops in line 81 "xmlDoc.Load(filepath);". I don't known where is problem and how to make it works. MethodAccessException: Attempt to access a private/protected method failed. Unfortunately are still very few functional tutorials on the net about xml parsing. and also unfortunately the.... "Try this" option does not work in any version. Hey I'm using a very similar method for a data logger when saving but I'm running into an odd issue. The xml document gets saved but will only update if I leave switch from Unity to another program, then back to Unity. Any ideas why? For anyone else that runs into this issue, the problem isn't that the xml file isn't getting saved, it's that Unity's TextAsset that represents the xml file is not getting updated. Simply throwing AssetDatabase.Refresh(); after the save will fix the issue. Hi, it works well in editor, but I get MethodAccessException : Attempt to Acess a provate/protected method failed. does this works on android devices ? Hello , After finishing the game i Build the game on win standalone . i faced problem when saving into Xml . it does not work until i open the game as Admin . do you have a way to fix it ? i want to do the same thing but xml is not in project ...it will come from some url ..... I am using www .... iwas getting dat from there but its not getting saved(post)... any help on it how to that? I watched your video on youtube and commented way too early. Was confused why you didn't show any of the code that actually saved the information. Must apologize for that. Found this site and am so extremely grateful for your help! This was exactly what I was looking for to get started with what I am trying to do. Much much thanks for your work! Thanks A bunch. This is likely the best tutorial for someone who is just starting the basics of this.. You Rock!